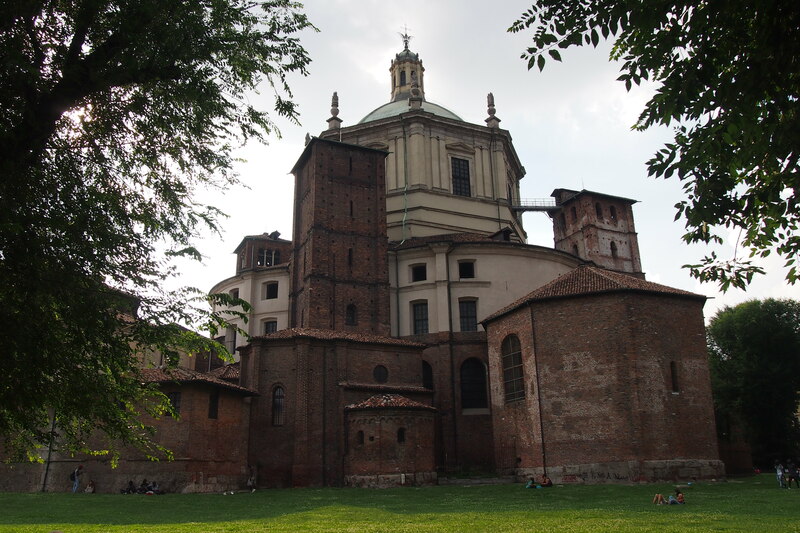 Built sometime between the 4th and 5th centuries, the Basilica of San Lorenzo is one of the oldest churches in Milan; even the names of the persons behind this structure have been lost, and the exact dates and purpose for building it is unknown. Regardless, it is one of the most intriguing churches I’ve been to – and definitely the least crowded. I was the only tourist! I wasn’t able to get a nice photo of the facade because it was barricaded (no point taking photos when all I can show you are steel bars). Plus, I ran into a group of goths dressed in leather, spikes and dark lips and I hightailed out of the place after that (I fear the living more than I fear ghosts or monsters – I am a practical person after all) so all I can show you is the back, which opens up into a park previously used for, among others, public executions. Nowadays, it’s a nice hangout for exercise, picnics or just walking your dog. Upon entering the place, I was immediately greeted by an eerie silence, darkness, and a cold draft of air. Seriously, this is the most spooky church I’ve been too, even though it’s very beautiful and solemn. The church is quite unique in that it is a bit circular as opposed to the usual cross-shaped structure and there are many rooms and a chapel off to the side, though most are off limits. 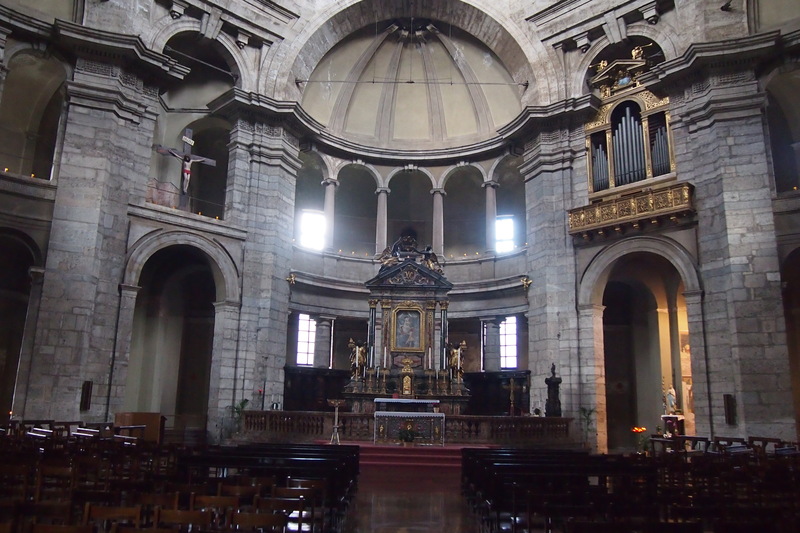 For a church that appears to me to have very few parishioners (most probably because the Duomo of Milan is just 10-15 minutes away and I spied two more churches in between the two), it is well maintained and clean, although the air feels damp. 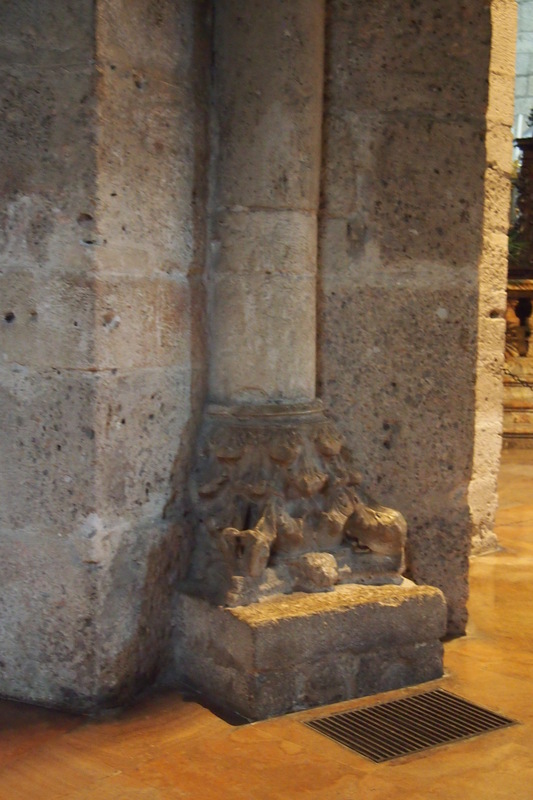 Several of the church’s pillars are recycled – they used some of the columns from the ruins of a Roman amphitheater just outside the basilica which gives the impression that the church is much older, and contributes to its appeal. For some reason though, they used the pillars upside down so that the carved cornices are at the foot of the post instead of at the top. …which made one hell of a ruckus I probably woke up the entire church. Hahaha! Anyway, probably hearing my coins, the lone caretaker (not a hunchback, thank heavens) suddenly appeared behind me. He was very nice especially when he realized I was by myself, pointing out the most interesting spots and explaining their history to me. We did have a rocky start because I couldn’t understand what he was trying to tell me at first – that I had to pay an entrance fee to get into the the other parts of the church. How we managed to communicate with only Italian words (he appears to speak zero English and I know just enough to get by) leaves me baffled to this day. 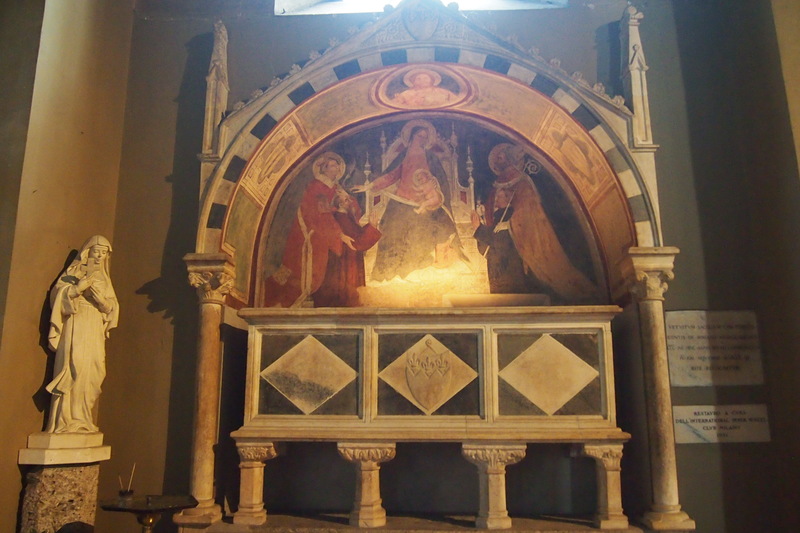 One of the most interesting parts of the basilica is the octagonal chapel of St. Aquilino, which has retained its original structure and can be accessed via a “pincer-shaped” entrance to the south of the main church. 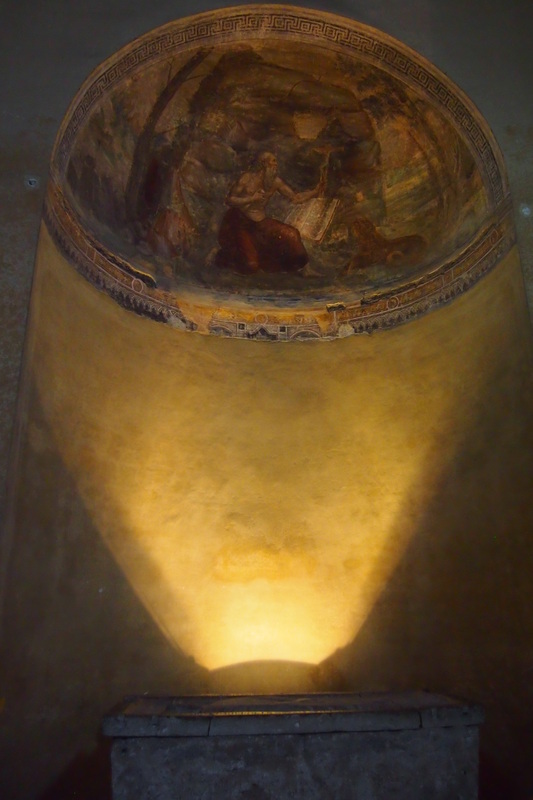 The chapel used terracotta ducts and the original dome (which is one of the oldest parts of the church, at 1,600 years old) is hemispherical. 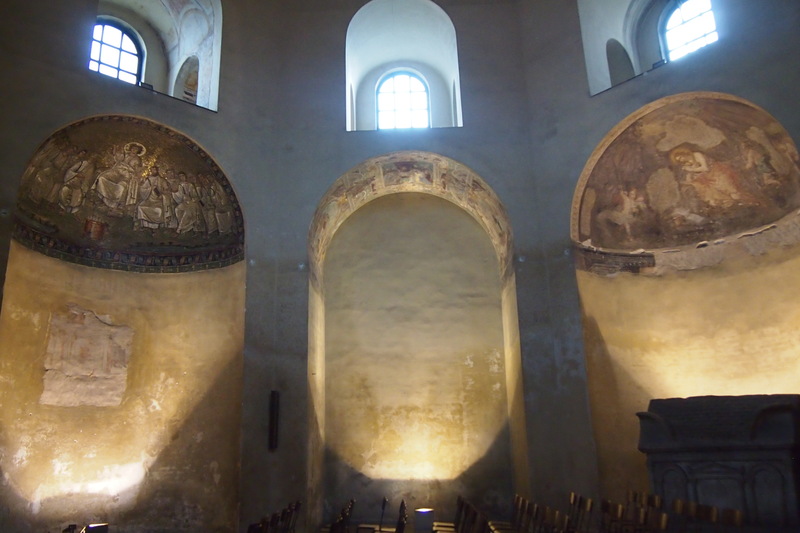 Inside is a succession of semi-circular and rectangular niches with Byzantine mosaics at the ceiling. 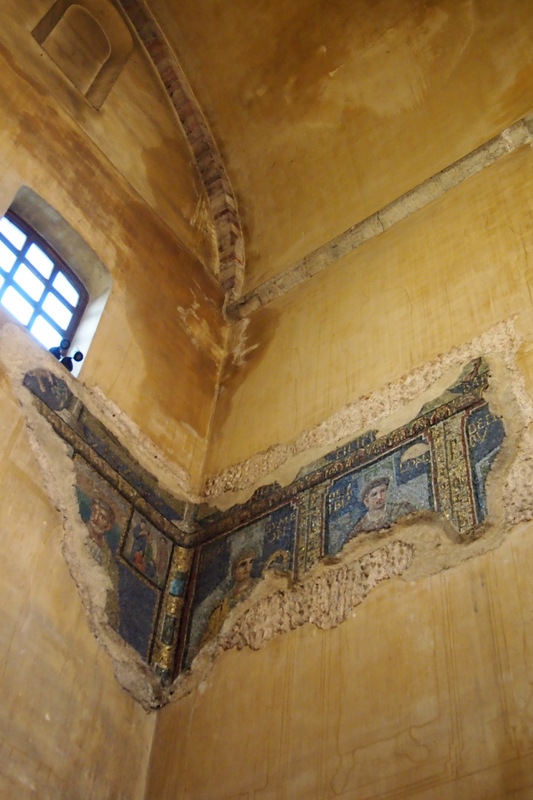 Some of the mosaics are in badly worn out, and in some cases, have fallen out that y0u are left with the artist’s drawings, but nevertheless, the walls are still very pretty. Here’s a close up of the mosaic above the first entryway. 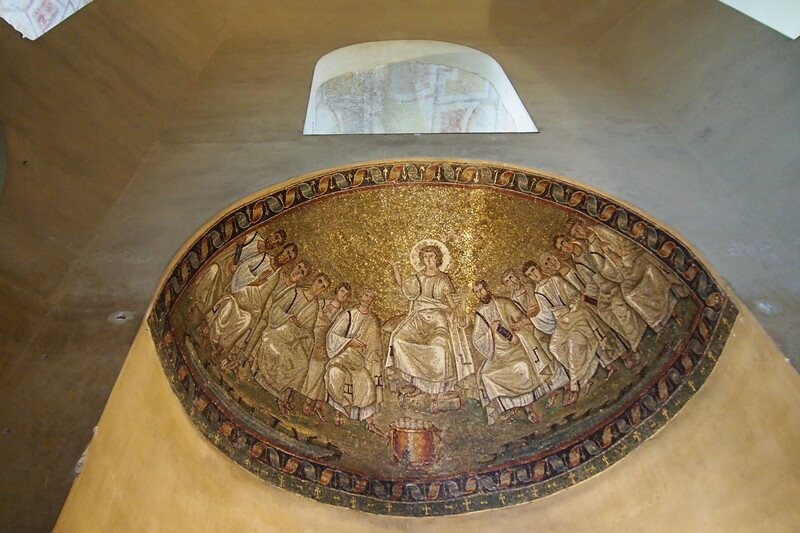 In some parts, you can clearly see that there must have been various mosaics or paintings that have each been painted over during its long existence, so I can only imagine how hard it must be to reconstruct and restore these walls. There are various color schemes as well – this room obviously had blue for its motif. The last room immediately before the rooms where Saint Aquilino’s remains are kept, has perhaps the most beautifully preserved mosaics in the chapel and is the third spookiest place in the church, what with all those eerie spotlights casting an ethereal glow over everrything – and yes, the only light from outside are coming from those windows. 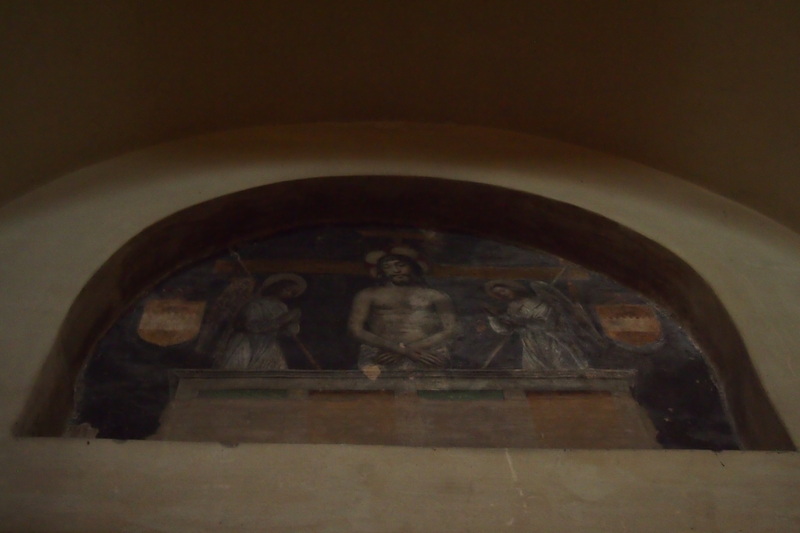 This one, where almost only the drawing is left, can be found in one of the alcoves on the opposite wall but I could not figure out (or research on the net) what it’s supposed to be. Can you spy that rectangular slab or marble? I saw several of them in the room and while I couldn’t find any inscription, I think these are the tombs of various members of the imperial family as it served as the imperial mausoleum when it was initially built. 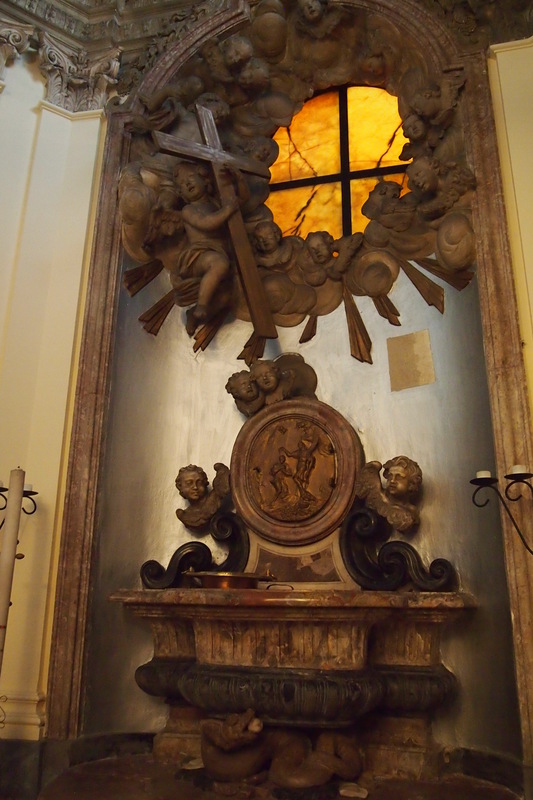 The next room is the 2nd scariest place – I was by this time, about ten meters from the only entrance/exit of the chapel and I was the only living soul in the place so my goosebumps were literally jumping off my skin. I almost turned around since I didn’t want to get close to the coffin but the caretaker was again right behind me, prodding me to move forward. He was actually starting to give me the creeps as well – less than a minutes after telling me to go into the next room, when I turned around, he was gone. Either he vanished into thin air, or he ran really fast. 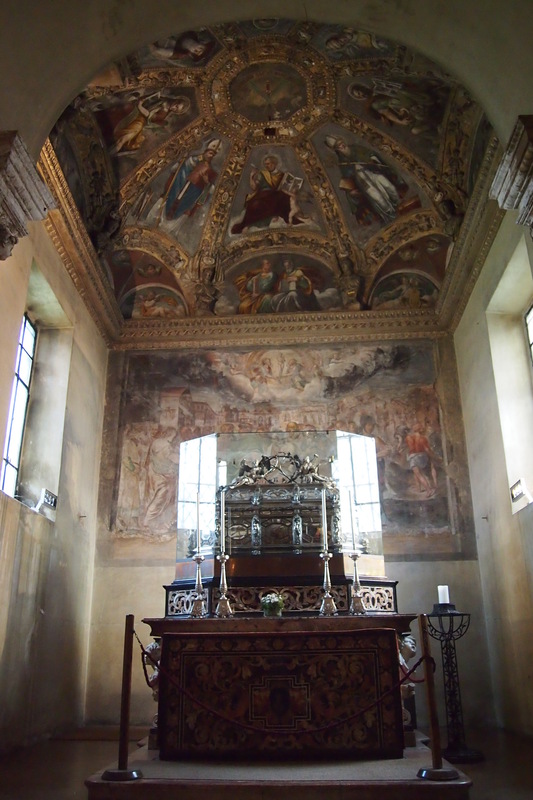 Ah, but the sight inside is a marvel with its carved, painted and gilded ceiling, the fresco by Carlo Urbino behind the ark and the silver ark itself created by Carlo Garavaglia, all very exquisitely done. I was by this point scared out of my wits and would gladly have ignored the fact that there was a flight of stairs behind the ark were it not for the caretaker who magically popped up again to hold my hand and take me to the top step of the stairs. I wanted to tell him, no, I am already fine with what I’ve seen so far, but, he wouldn’t take no for an answer. I was so scared he would lock the gates behind me once I’ve descended though I was comforted by the fact that my friends all knew where I was, plus, my curiosity got the better of me. And what do you know? Such a treasure! 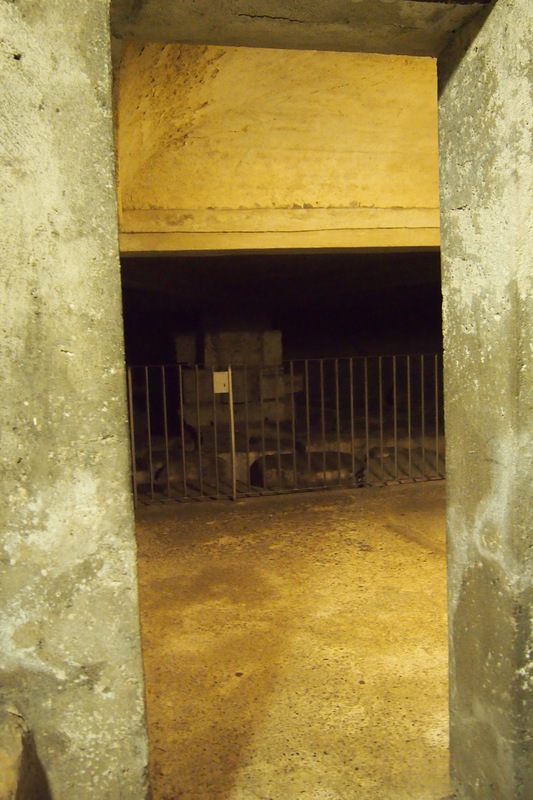 Seems that underneath the chapel is an ongoing excavation – from this photo, you can see a glimpse of the church’s foundation (or perhaps the ruin of the old complex), back from Roman times! I didn’t dare go further than this though since the cold, airless feeling was getting to me and I rushed back to the chapel and headed straight for the main church. Seeing as I was the only tourist, the caretaker told me he would show me a room that is off-limits to the public – I could tell based on the tone of his voice and the fact that the door had a big off limits sign. Hahaha! 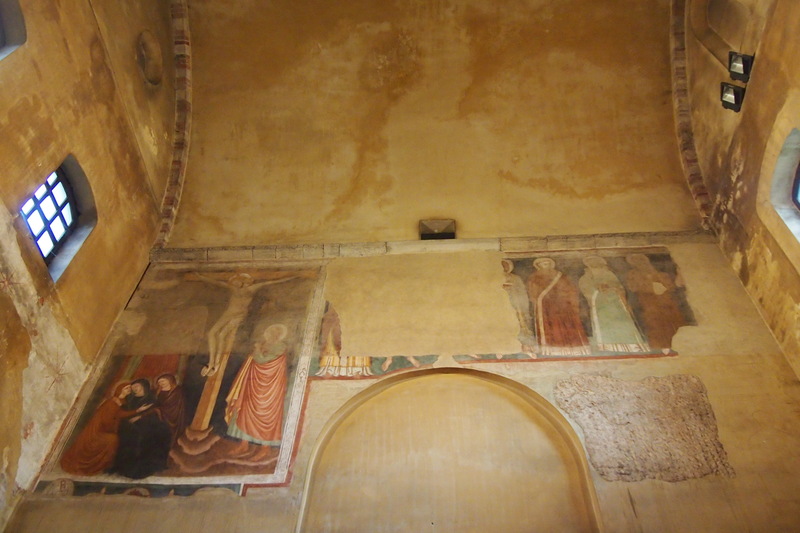 Inside are various religious treasure (which I didn’t photograph – I assumed that similar to Manila, taking pictures of such things are generally not allowed), and the best of all was this old baptistry – for the “ninos”and “ninas” as the caretaker put it. I was so happy to have been given that exclusive tour I almost berated myself for being suspicious of the caretaker. Hahaha! But I was more than relieved to finally walk out of the basilica and into the direct heat of the sun (and I still can’t shake off the feeling that he was a ghost or something, or that he walked at lightning speed). 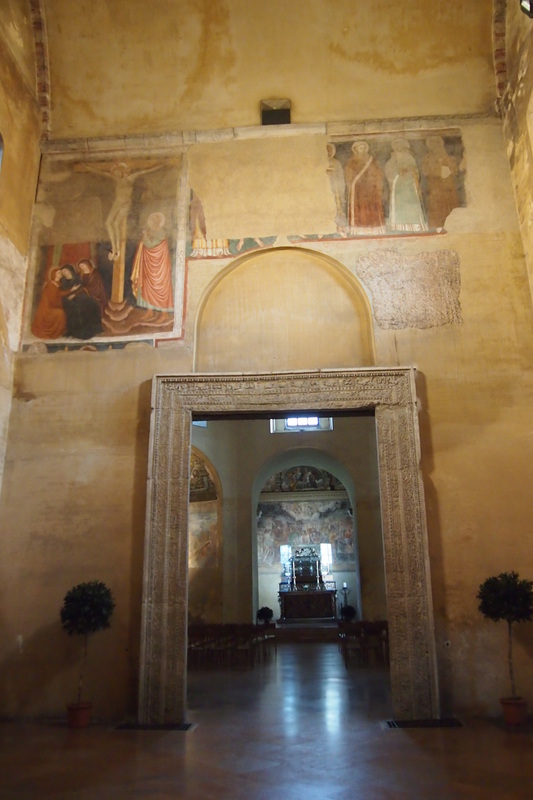 The Basilica of San Lorenzo is part of the Basilicas Park, where the Basilica of Saint Eustorgio (where the tomb of the three Magis are) and the Colonne di San Lorenzo can also be found. 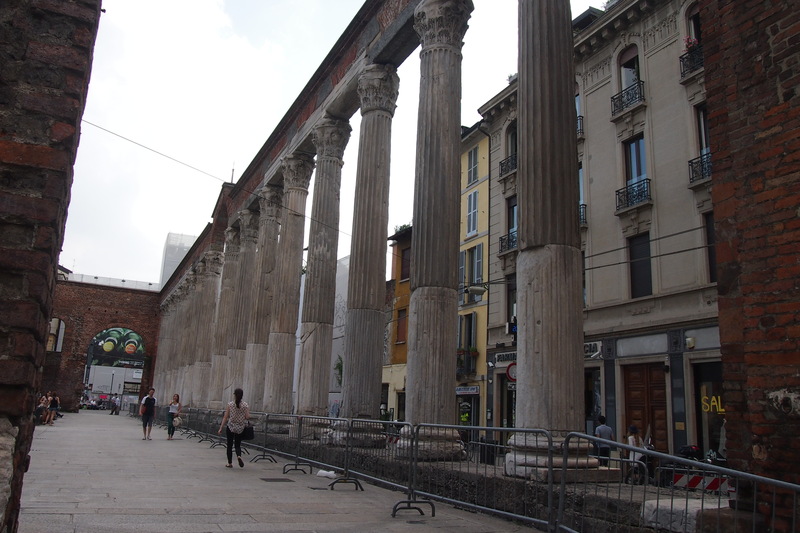 I didn’t get to Saint Eustorgio (I didn’t have time to visit both so I chose the one which I felt was more historically and architecturally significant) but the columns were right out front of the Basilica of San Lorenzo and cannot be missed. 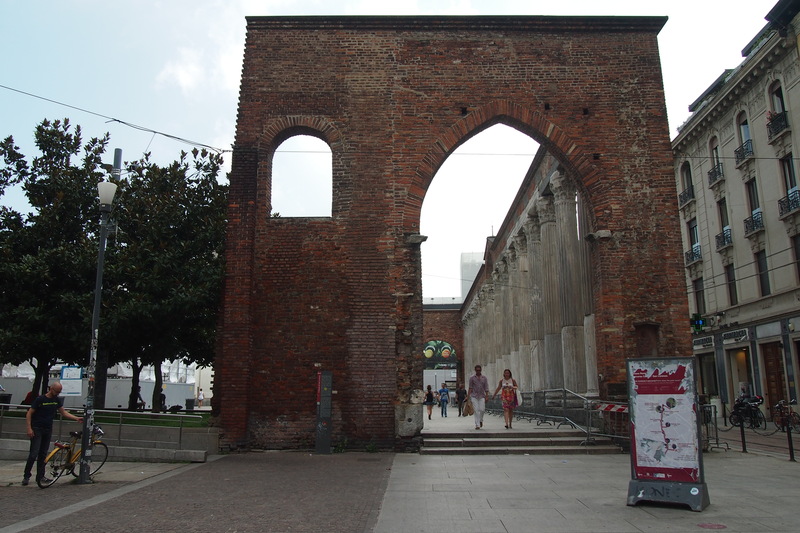 It is the most well-know Roman ruins in Milan, with the columns dating from the 2nd century, taken from old baths and temples. A lot of people also gather here, with some musicians and dancers offering free entertainment during the early summer evenings, and crowds waiting perhaps for the clubs nearby to open pass the time here so it can get pretty crowded and smoky. If you’re planning to take a nice photo, I would suggest you visit early in the morning. There are a couple of other old churches nearby but time was too short. 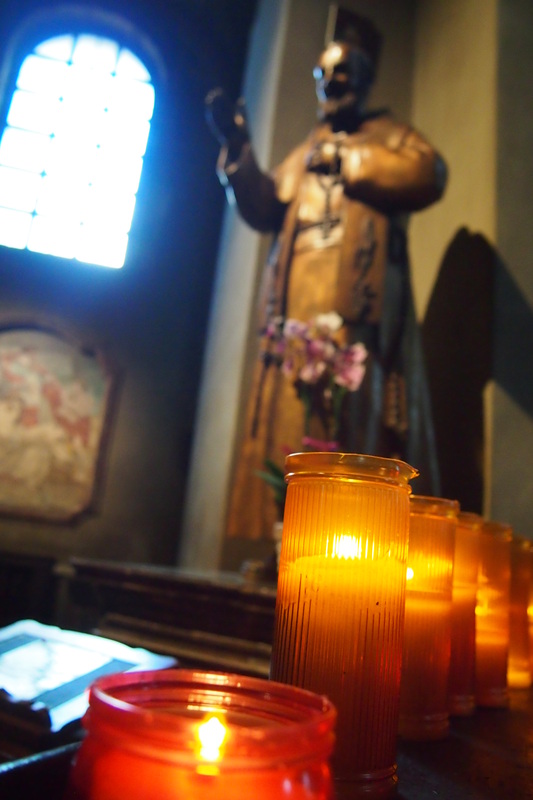 I will write next about the Duomo, which I visited several times during our stay in Milan.